The No. 1 objective of most families is to help their loved ones stay in their own home in a safe and familiar environment for as long as possible. No one’s first choice is to go to a facility or an institution no matter how pretty the building or the décor. For a senior to stay in their own home safely they may need just a few hours of assistance or they may need 24/7 care. A Better Living Home Care offers a free in home care consultation and assessment to assist you in determining the best in home care solution based on your needs and within your budget and provide a home caregiver suited to meet your needs. 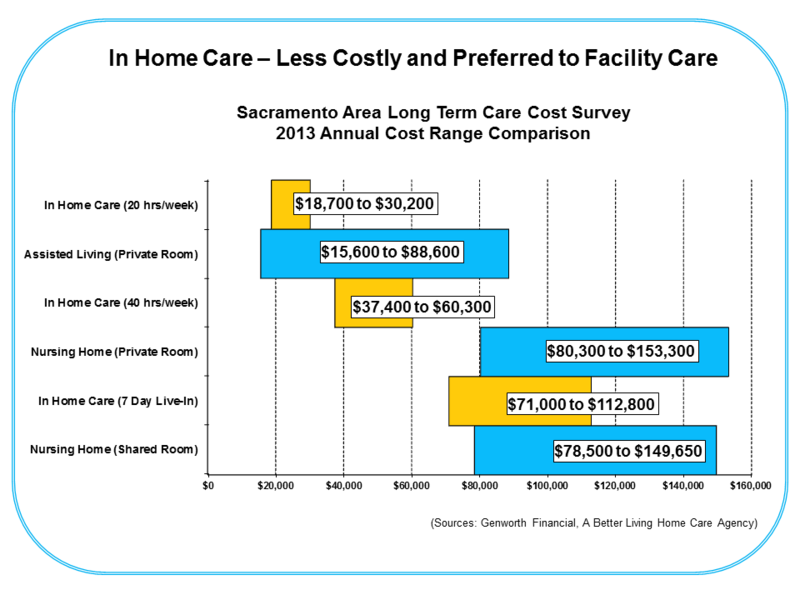 Throughout Greater Sacramento in home care is not only preferred by 89% of seniors over facility care, it costs less. The chart on this page compares the annual costs of assisted living facilities and nursing homes to hourly and live-in home care. The bars indicate the annual cost of long term care from the lowest cost provider (on the left) to the highest cost provider (on the right). Long term care providers include: assisted living facilities, nursing homes, and home care agencies. The cost of Hourly Care at 20 and 40 hours per week from a home care agency is compared to the cost of assisted living facilities; and the cost of home care agency 7-day Live-in Care is compared to nursing homes. If you are considering an assisted living facility, you can see that hiring a caregiver for 40 hours a week is about equal to the average cost of a local assisted living facility. 20 hours of in home care a week costs about the same as the cheapest assisted living facilities. Even when you compare the cost of 7-day Live-in Care (that’s 24/7 one-on one assistance at home) it compares favorably to the higher cost assisted living facilities. When considering home care vs. assisted living, the cost is not the driving factor in the decision, it boils down to lifestyle and quality of life. If you have higher level needs and are considering placement in a nursing home, in home care is clearly more affordable than nursing home care. The chart above compares 7-day Live-in Care to the cost of a private room and shared room in local nursing homes. The most expensive agency offers Live-Ins at a cost less than most nursing home offer a shared room. What about the quality of care? At Better Living Home Care, we routinely provide higher needs clients with caregivers who are CNA certified. CNA’s are the same care providers that nursing homes hire to provide hands on care. The vast majority of seniors living in nursing homes could be living at home with the right caregiver, and it would cost less. By talking with a A Better Living Home Care expert, we will make sure you understand the services you need, how often, and for how many hours per day. We will help you develop a budget and share with you the ways families have been able to pool their resources together to provide this care to their loved ones. How much will it cost your family? The best way to know exactly how much home care services will cost is to talk to one of our professionals. Together you can come up with a plan of care and a number of hours that is not only affordable, but keeps your aging loved one safe and in their own home. Ask about options like The VA Aid and Attendance Pension Benefit, life settlements, and long-term care insurance. Chances are that one of those programs may be able to help with the cost. How soon can home care services start? The start date is up to you, but our team is dedicated to getting a caregiver in your home as soon as you need them. It is best to be proactive. Call today to speak to one of our staff members so you will have all the information you need when the time comes and you are ready to start services. We have been accepting long term care insurance for many years and can assist you in filing your claim, provide necessary forms and help if you have any problems down the road. Is Home Care Paid By Medicare or Health Insurance? Unfortunately Medicare, and most health insurance companies do no consider in-home care a medical service, so they do not provide coverage and health care reform has not affected their policies. We specialize in providing in-home care custom tailored to your specific needs.